Russia captain Alena Mikhaltsova scooped the first DHL Impact Player award of the HSBC World Rugby Women's Sevens Series 2019. 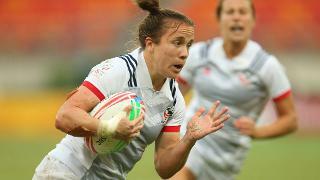 Alena Mikhaltsova was named the DHL Impact Player for the HSBC USA Women's Sevens in Glendale as Russia finished seventh at the first round of the HSBC World Rugby Women's Sevens Series 2019. The 24-year-old finished the tournament nine points clear of Ireland captain Lucy Mulhall in the DHL Performance Tracker to claim the award for the third time in six series tournaments having done so in Dubai and Kitakyushu in the 2018 series. Russia's captain was at the heart of everything they did at Infinity Park, scoring six tries, including doubles against series debutants Mexico in the pool stages and England in the seventh place play-off. Mikhaltsova topped the charts for most carries (31) and was one shy of Portia Woodman's 10 line breaks, which when combined with 10 tackles and seven offloads gives her a total of 57 points for the US round of the series. Her Russian team-mate Anna Baranchuk and Mulhall were the top tacklers with 17, while Fiji's Litia Naiqato made the most offloads with 11 as her side finished as Challenge Trophy runners-up. The next round of the series takes place in Dubai on 29-30 November.